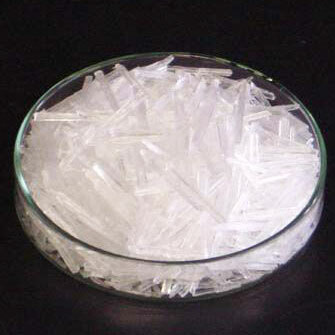 Menthol Crystal is an Organic Compound derived from Mentha Oil. Menthol Bold Crystal are cooling, refreshing, and have a pleasantly strong minty aroma. They are often used in cosmetics, Herbal Oil, Balms, Medicated creams, throat lozenges, toothpaste, Mouthwash, Gum, pain relief or cooling body products, shampoos, conditioners, shaving creams, oral or throat sprays, compresses, medicated oils, and cooling gels. The clients can avail the Menthol Bold Crystal from us in varied quantities at reasonable price. Odor Cool Pleasant Odor with Peppermint Characteristic. Packing In New 25 kg Fibre Drums, Air tight, packed at controlled room temperature and lining with thermocol sheet. Storage Please keep in cool, dry place to retain its original shape.